Over a decade before Neil Armstrong made "one small step for man," MAKER Katherine Johnson was making giant leaps for all women. Despite the fact that Johnson was the "human computer" behind the calculations that were critical to launching the first American in space, sending the first American man to orbit the Earth, and landing the first human on the moon, her place in history remained largely unrecognized—until now. In addition to a bestselling book inspired by her life, an Oscar-nominated movie dedicated to her legacy, and a NASA building named in her honor, Katherine Johnson is receiving yet another recognition: Johnson will have a statue erected at her alma mater West Virginia State University where she was one of three African-American students to desegregate the graduate program at the university in the late 1930s. The latest honor bestowed upon the NASA trailblazer will be a bronze statue at West Virginia State University. In addition to the sculpture, West Virginia State University is also creating a $100,000 scholarship for underrepresented students majoring in science, technology, engineering, and math. The dedication ceremony is planned for August 25, 2018— the day before Johnson turns 100. In the late 1930s, Johnson was one of three African-American students hand-picked to integrate into the school's graduate program, just one of countless times that she shattered ceilings for black women in STEM fields. In celebration of the mathematician who helped launch Americans into space and land man on the moon, NASA named a building in her honor in 2016. The Katherine G. Johnson Computational Research Facility is located at NASA's Langley Research Center in Hampton, Virginia, the very center where she calculated the flight trajectory for the first American in space in 1961 and battled gender and racial discrimination daily. In 2016, Johnson was also presented with the Space Flight Awareness Silver Snoopy award, which goes to "individuals who have made outstanding contributions to human spaceflight safety." Johnson's story was catapulted into the spotlight by Margot Lee Shetterly in "Hidden Figures: The American Dream and the Untold Story of the Black Women Who Helped Win the Space Race." The 2016 non-fiction book chronicled the critical role that Johnson and her fellow African-American female mathematicians Dorothy Vaughan and Mary Jackson had in launching the U.S. into space all while overcoming discrimination at NASA. The untold story of Johnson and her fellow black "human computers" reached No. 1 on The New York Times Best Sellers list and received the Anisfield-Wolf Book Award for Nonfiction in 2017. It wasn't long before the story of how Johnson made history was brought to life in Hollywood by a trio of fierce, leading ladies including Taraji P. Henson, Octavia Spencer, and Janelle Monae. In the 2016 blockbuster, Henson portrays Johnson while she was working as a mathematician at Langley Research Center in Hampton, Virginia, in the heat of the space race between the U.S and the Soviet Union. Henson depicts how Johnson boldly rose above her white, male colleagues to solve equations critical to launching astronaut John Glenn into orbit while remaining resilient against harsh discrimination in the office and in the community. The film was nominated for multiple awards including Best Picture at the Academy Awards in 2017. Katherine Johnson made a rare public appearance at the 2017 Oscar Award ceremony with "Hidden Figures" stars Taraji P. Henson, Octavia Spencer, and Janelle Monae. After Henson introduced her as a "true NASA and American hero," Johnson made her way on to the Oscars stage in a wheelchair and was greeted with thunderous applause and a few tears. The celebrated NASA mathematician then helped the cast present the Best Documentary Award. Before Katharine Johnson became a household name, she received the Presidential Medal of Freedom, the nation's highest civilian honor, in 2015 from Barack Obama. 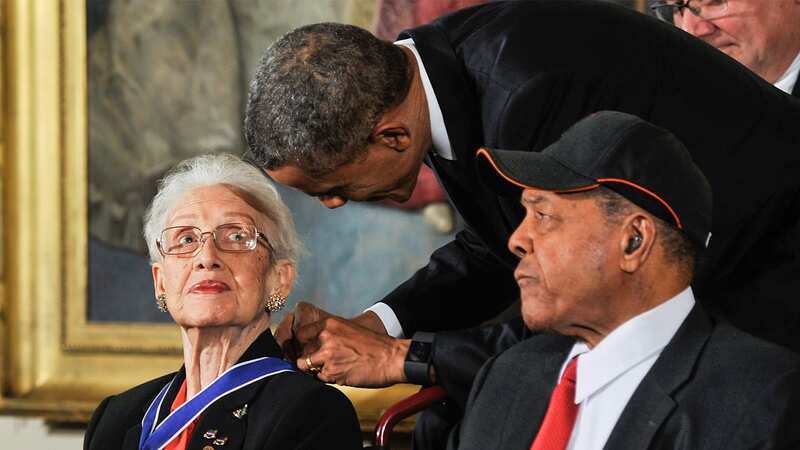 At the White House ceremony, Johnson was honored for her "razor-sharp mathematical mind" and helping "chart new frontiers for humanities exploration of space," playing a critical role in many of NASA's important milestones. The President presented Johnson the gold star himself, giving her a kiss on the cheek.